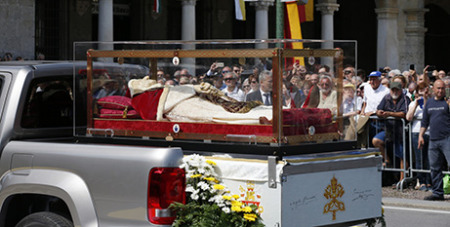 The glass coffin containing the body of St John XXIII was returned yesterday to his home diocese of Bergamo, Italy, to mark the 60th anniversary of his papal election and 55 years since his death. Source: CNS. Accompanied by Bishop Francesco Beschi of Bergamo and escorted by both Italian and Vatican police officers, the glass coffin left the Vatican early May 24 for the 600-kilometre drive to Bergamo in Italy's Lombardi region. The route taken for the trip north was kept secret for security reasons. St John, who opened the Second Vatican Council, was born November 25, 1881, in Sotto il Monte, a town near Bergamo. After his ordination as a priest and years of service in the Vatican diplomatic corps, he was appointed patriarch of Venice in 1953. He was elected pope on October 28, 1958, and died five years later. In connection with the pilgrimage of St John’s relics, Pope Francis gave an interview to the diocesan daily newspaper L’Eco di Bergamo. Pilgrims can pray before the saint’s remains at the shrine until June 10, when Cardinal Pietro Parolin, Vatican secretary of state, will celebrate Mass and the body will be returned to the Vatican.